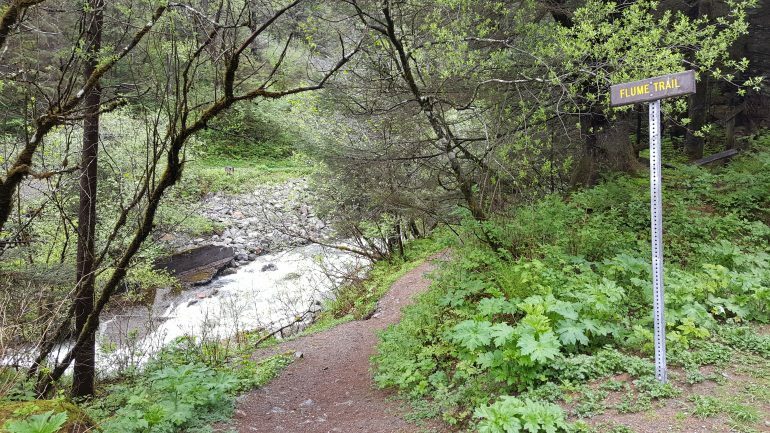 Flume Trail is an easy, accessible, yet breathtakingly beautiful trail. 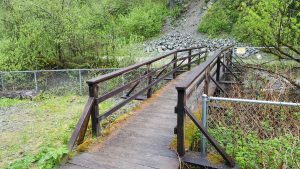 You will quickly realize how the trail got it’s name as it runs from the dam on Gold Creek and over the flume where water is diverted to serve the city. It is a wonderful trail for all skill levels and connects Basin road and Evergreen Ave. 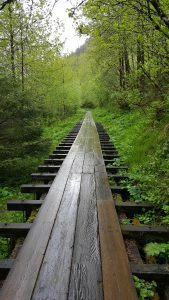 It is one of my home trails and I regularly take advantage of this treasure. 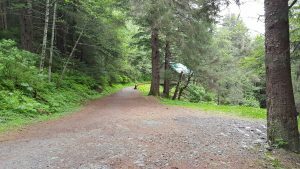 Starting from Basin Road, Flume Trail will begin across from the Mount Roberts trail head. 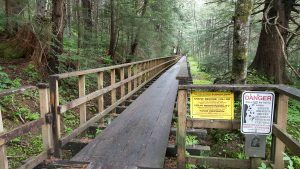 A charming bridge will get you across Gold Creek. 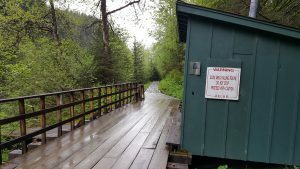 The trail will proceed to the flume on the left. Although the trail runs along the edge of the mountain, there is no need to worry about the avalanche warning. Be more concerned about bear encounters. But don’t worry, you will see more waterfalls and gigantic dandelions than bears. Flume Trail is a little over 1.5 miles long. It is flat and easily accessible for everyone. I walk at a very slow pace and can complete it in a half hour. The hardest portion to navigate is where the water falls intersect with the tail. This leaves debris covering the flume. 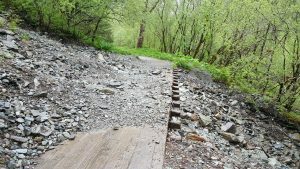 The kind folks of the City of Juneau maintain the trail and always try to keep it clear. But an early morning walk after bad weather can reveal a treacherous crossing, whether from snow, ice, or run off. Here you can see the top of the flume. 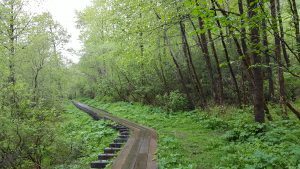 Due to its close proximity to downtown, the trail’s popularity becomes one of its drawbacks. On a beautiful day it can get a little crowded because it is definitely no secret. 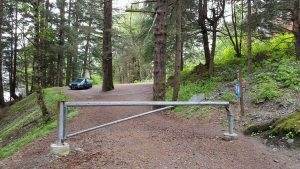 Here is Evergreen Ave parking lot, the opposite trail head. You can go down Evergreen and make the first left to take the stairs down to the cemetery. 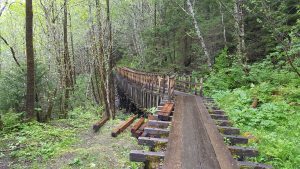 I would highly recommend this trail regardless if you start on Basin road or Evergreen Ave. If you have a few moments to spare, it is worth the experience.